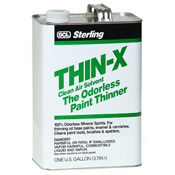 This clean air multi-purpose low odor, mineral spirit thins exterior/interior paints, flats, enamels and varnishes. Wipes fresh paint from painting tools, buckets and pans and partially dried drippings of oil base and latex paint. Removes wax, grease, soot and dust before refinishing surfaces. Meets rule 66 environmental standards. 100014 Quart 6/case 082069600148 11 lbs. 100011 Gallon 4/case 082069600117 29 lbs. 100006 5 Gal. Drum 082069600063 35 lbs. 100055 55 Gal. Drum 082069600551 380 lbs. 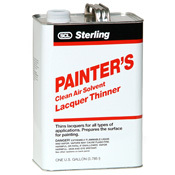 A thinner for odorless oil base paints and varnishes. 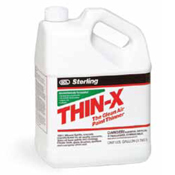 Has less solvency than regular Thin-X®, but is entirely odorless. Artists rely on its consistency while hospitals and institutions count on no odor. 101004 Quart 6/case 082069610048 12 lbs. 101001 Gallon 4/case 082069610017 29 lbs. 101005 5 Gal. Drum 082069610055 33 lbs. 101055 55 Gal. Drum 082069610550 380 lbs. 100% solvent free and odorless. It is designed to thin latex and water based paints, enamels and clear finishes. DO NOT USE WITH OIL BASE PAINTS. It enhances the flow and leveling as the finish is applied. The product will clean brushes, rollers, sprayers, buckets and paint trays while latex paint is still wet or soft. Hardened brushes can be cleaned by soaking overnight, slightly longer in extreme cases. Bristles will be soft and supple after cleaning. Old semi-jelled latex paint can be rejuvenated with small amounts of Thin-X® Latex Paint Thinner. Contains no detergent or harmful ingredients. Safe for septic systems. 080614 Quart 6/case 082069648140 15 lbs. 080611 Gallon 4/case 082069648119 34 lbs. 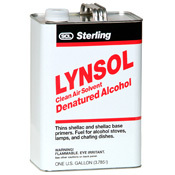 The purest ethyl alcohol to thin shellac, stain, sealers or spirit varnishes. Cleans shellac surfaces and brushes. Other uses: fuel for marine alcohol stoves and chafing dishes when used indoors in extreme care. Not for charcoal cookers. Burns with a nearly invisible, smokeless flame. 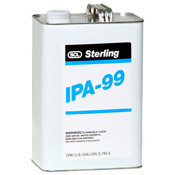 Cleans printing presses and typewriters. Flammable. 103004 Quart 6/case 082069640045 12 lbs. 103001 Gallon 4/case 082069640014 31 lbs. 103006 5 Gal. Drum 082069640069 37 lbs. 103054 54 Gal. Drum 082069640540 400 lbs. 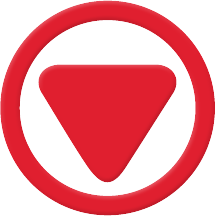 Economical cleaner for tools, printing presses and silk screens. Test Screens before using. Flammable. 103904 Quart 6/case 082069649048 12 lbs. 103901 Gallon 4/case 082069649017 31 lbs. 103906 5 Gal. Drum 082069649062 37 lbs. 103954 54 Gal. Drum 082069649543 400 lbs. 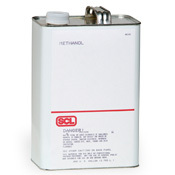 This full strength, clean air solvent thins lacquers for all types of application. Cleans, conditions and prepares the surface. Cleans panting tools, brushes, sprayers, rollers and applicators. Extremely Flammable. 104004 Quart 6/case 082069650044 12 lbs. 104001 Gallon 4/case 082069650013 31 lbs. 104006 5 Gal. Drum 082069650068 36 lbs. 104054 54 Gal. Drum 082069650549 400 lbs. A strong solvent for most plastics and synthetic fibers. 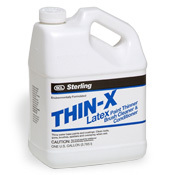 The fastest evaporating solvent available for thinning and cleaning fiberglass resins and epoxies before they harden. It is non-photochemically reactive and VOC exempt. Extremely Flammable. 400004 Quart 6/case 082069750041 12 lbs. 400001 Gallon 4/case 082069750010 31 lbs. 400006 5 Gal. Drum 082069750065 37 lbs. 400079 54 Gal. Drum 082069750799 395 lbs. Gum Turps is pure spirits of gum turpentine distilled from the living pine tree. 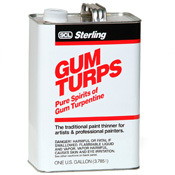 Gum Turps is the traditional paint thinner for artists and professional painters. It is chemically pure and free from all adulterants. Thins paints, varnishes and enamels. Removes grease, stains and tar. Not recommended as a cleaning solvent because it will leave a slight surface film. 101504 Quart 6/case 082069620047 13 lbs. 101501 Gallon 4/case 082069620016 33 lbs. 101506 5 Gal. Drum 082069620061 35 lbs. 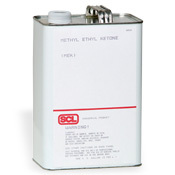 A strong specialty solvent similar to Acetone. Its slower evaporation rate makes it a better choice for cleaning and degreasing applications. Flammable. 400101 Gallon 4/case 082069752014 29 lbs. 400106 5 Gal. Drum 082069752069 37 lbs. 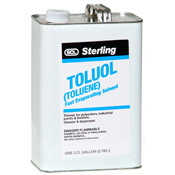 A good clean-up solvent for shellac-based coatings. An acceptable fuel for alcohol stoves, although it produces less heat per pound than denatured ethyl alcohol. Poison if ingested. Not recommended for burning or for use in confined areas. Flammable. 401101 Gallon 4/case 082069762013 29 lbs. 401106 5 Gal. Drum 082069762068 37 lbs. 401155 55 Gal. Drum 082069762556 400 lbs. A mild cleaner for glass, painted woodwork and trim. Completely miscible with water. Can be added to detergent solutions to enhance action. Flammable. 401201 Gallon 4/case 082069765014 30 lbs. 401206 5 Gal. Drum 082069765069 37 lbs. 401280 55 Gal. Drum 082069765809 396 lbs. 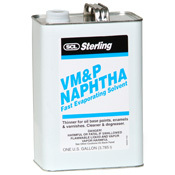 Varnish makers and painters' Naphtha. This quick drying solvent for oil-based paints provides rapid initial evaporation and allows for good brushing and lapping properties. As strong as mineral spirits but evaporates more quickly. Flammable. 404101 Gallon 4/case 082069792010 30 lbs. 404106 5 Gal. Drum 082069792065 35 lbs. 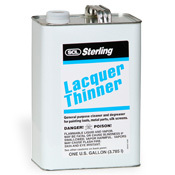 Often specified as a thinner for specialty paints and coatings. A good general purpose cleaner and degreaser. Slower evaporation rate than acetone but faster than xylol. Flammable. 405001 Gallon 4/case 082069794014 33 lbs. 405006 5 Gal. Drum 082069794069 40 lbs. A relatively slow evaporating solvent and thinner for some synthetic coatings as well as paints and varnishes. Has stronger solvent power than mineral spirits. Evaporates slower than toluol. Should only be used as a thinner when specified by coatings manufacturer. Flammable. 406001 Gallon 4/case 082069796018 33 lbs. 406006 5 Gal. Drum 082069796063 39 lbs. 406054 54 Gal. Drum 082069796544 435 lbs. 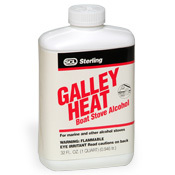 Fuel for marine alcohol stoves and chafing dishes. Burns with a nearly invisible, smokeless flame. Low odor. Not for charcoal cookers. Flammable. 080014 Quart 6/case 082069643047 12 lbs.